As a writer for Fireworks Magazine and Rocktopia, I spend the bulk of my time writing about classic rock, along with some AOR and melodic rock. That's not to say I'm a stranger to metal - far from it. I'm a big fan of Sebastian Bach, have a long standing appreciation for Black Sabbath albums from all eras of the band, plenty of Ozzy Osbourne (although I dispute the claim that his solo output is metal, rather than classic rock), not to mention a passion for powerhouse US act Fozzy and the mighty Motörhead. Therefore, when asked to review the debut EP by Hull's unsigned metal quartet Teras I felt confident I had enough knowledge to do a professional job. 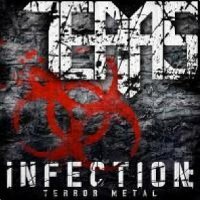 Citing the likes of Zakk Wylde's Black Label Society, Pantera, Anthrax and Slayer among their influences, 'Infection: Terror Metal' was never likely to be big on ballads. Indeed, the EP comes flying out of the blocks with the breakneck 'Sovernguarde'. The pounding rhythm section of drummer Stephen Kitapci and bassist Dom Mooney is flanked by rhythm guitarist Aaron Sonley, while lead axe man Jack Robert Robson provides the cutting solo. Mooney also handles vocals duties, electing to deliver everything with a guttural death metal growl. I've never been a fan of this style but fully acknowledge that there is an audience for it - former Sepultura vocalist Max Cavalera springs to mind as one such example, as does Glen Benton from Deicide. However, unlike Cavalera and Benton, Mooney's approach makes the lyrics range from hard to decipher to mostly downright unintelligible. 'Outlaw' lures you in with it's jangly intro, before the guitar gets fuzzed up and the rest of the band kick in. At this point, I'm struck by how well produced the EP is for a young, independent act. So many young metal bands end up with a muddy sound, or have far too much bottom end, whereas the overall balance in this mix is quite superb. The crunching rhythm and lead guitar tone mesh beautifully and the middle eight is very reminiscent of Black Sabbath's doom laden power chords. Again the vocals come in the form of monosyllabic grunts, which is a shame because the arrangement of the track shows much promise. 'Scythe Of War' (which was the band's previous name) scores major points for its use of one of my favourite percussive instruments, the cowbell. The fact that it's overlaid with an excellent meaty riff is simply audio icing on the cake. The grunting vocals are broken up a little here with the occasional break into the interpretable, where I actually heard the words 'Scythe Of War'. There's a nice toned down instrumental break which is a smart change of pace, before the band explode back in with a vengeance. These elements combined results in 'Scythe' being the highlight of the EP in terms of song writing. Finishing things of with 'Triggerman', the final track has the best riff on the record. The opening bars could easily be latter day Motörhead, and the relentless rhythm guitars in the verse pays homage to Judas Priest and and prime era Metallica. I'm a big fan of the guitar tones on 'Triggerman' and the production sound is tighter than an Emo's pants. The band's youth and enthusiasm has been captured with a powerhouse closing performance. There's much to celebrate on 'Infection: Terror Metal'. I've heard bands twice their age sound half as good. The only stumbling block for me is the vocals. Even when I think of the most extreme vocalists I've heard, such as Napalm Death's Mark "Barney" Greenway or Opeth's Mikael Åkerfeldt (especially when he sings with his other band Bloodbath), they have two advantages over Teras. Firstly, they don't use the growl on every song, all the time. Teras have shown great maturity in their song arrangements by breaking things up with well placed solos, breaks and bridges, but there is no such variation in the lead vocals. Secondly, at the risk of sounding like my grandma, I can understand every word of the other guys, where I struggled to make out more than three from Dom. With a strong set of songs to currently ply their trade and earn their stripes with on the live circuit, Teras are clearly doing something right. My personal opinion however, is the current vocal delivery is too extreme for the songs and reduces them to being a niche band. None of their main influences use this style, so my gut feeling is a change to a more conventional vocal approach would break them open to a much wider audience.